The United States government slapped American Honda Finance Corporation with a fine for a violation of U.S. sanctions against Cuba -- despite the fact the transactions occurred in Canada. Though it was Honda Canada Finance accused of violating the Trading with the Enemy Act, it was the California-based branch of Honda Motor Co. that agreed to settle US $87,255 with the U.S. Office of Foreign Assets Control after the Canadian financial arm engaged in lease agreements with the Cuban Embassy in Ottawa. 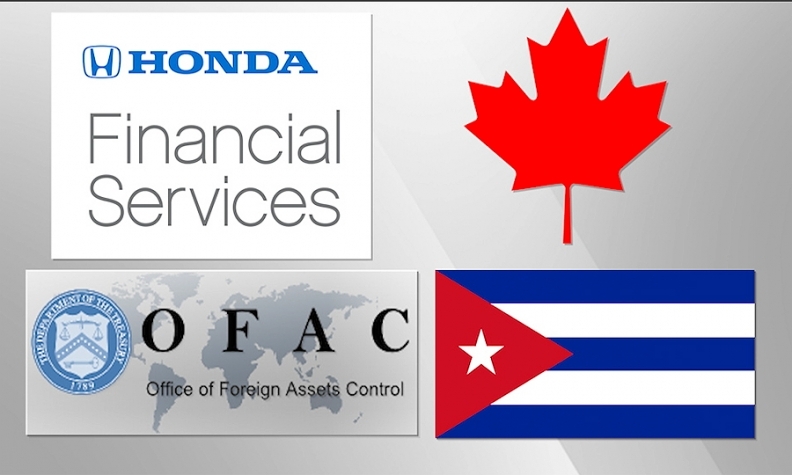 Honda Canada Finance -- a majority-owned subsidiary of the American Honda Finance Corp. -- is accused of violating the Cuban Assets Control Regulations with 13 lease agreements with the embassy between February 2011 and March 2014. While the transactions were legal in Canada, because American Honda is a majority stockholder, the Canadian company is subject to U.S. sanctions, according to U.S. law. "These transactions were permitted under Canadian law," Honda Canada Finance said in a statement. "This settlement has resolved this matter with OFAC and Honda considers it closed." Jessica Pawl, a spokesperson for American Honda Finance, said the company voluntarily and promptly disclosed the violation and cooperated with the resulting OFAC investigation. She added that AHFC has taken further action to implement governance policies to ensure it remains compliant with OFAC regulations. There are penalties for Canadian companies that adhere U.S. trade restrictions. Under the Foreign Extraterritorial Measures Order, Canadian companies are barred from complying to any U.S. ordinance that limits business dealings with Cuba. "Canada and Cuba have a long history of diplomatic and commercial relations," John Babcock, a spokesperson for Global Affairs Canada, said. "Canada has consistently opposed the extraterritorial application of United States sanctions, which interfere with the right of Canadian companies to conduct their business in a manner consistent with international trade practice and the laws of Canada."